The Yellow Team Champion practices with her war axe. Yellow Team Champion is a Nord who lives in the Arena Bloodworks. She alternates between practicing her Blunt and Hand to Hand skills. You will fight her in your final match in the Arena before facing the Grand Champion. She is consistently scornful towards your character, coming up with a new insult every time you secure advancement. When you have reached Hero status, she will say: "In the Arena I will make you beg for death." and has only negative comments to make, as opposed to the Blue Team Gladiator. 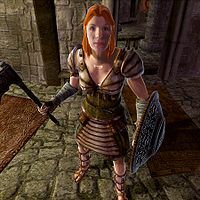 She wears a heavy raiment with an orcish shield (if you are below level 15: otherwise, it is leveled) and a steel war axe. When you fight her in the Arena she wears a leveled heavy helmet as well, and is additionally armed with a leveled longsword and a potion of healing. When you fight her in the Arena, she will also possess an ability that lets her resist magic and normal weapons 20%, and fortifies her Speed and Athletics. Arena: Battle your way through the ranks to become the "Arena Grand Champion". You will receive negative comments from the Yellow Team Champion depending on your Arena rank. Haven't Joined: I'm trying to train here, weakling. Why don't you go someplace more your speed, like the Mages Guild? Just Joined: I didn't come here to chat, Blue Team, scum! Crawl home while you still can! Pit Dog: I guess Owyn will let anyone join the Arena these days. I guess I shouldn't let it bother me, seeing as how you'll be dead tomorrow. Brawler: Well, well, still alive, are we? Amazing. I never thought you'd make it past the first combatant. Just make sure you remember your place, Brawler. Bloodletter: Ah, so it's Bloodletter now, is it? I remember when I achieved that rank, so very long ago. I showed such promise... unlike yourself. Myrmidon: My my my, look at the Myrmidon. Who are you fighting against up there, cripples and skooma addicts? Maybe some day they'll give you a real challenge. Warrior: Warrior? You? Ha ha ha ha ha ha ha ha! Just... Just look at you! Ha ha ha ha ha ha! Gladiator: So it's Gladiator now. Oh, I do long for the day when you can prove your true worth to me... in the Arena! Until that day comes, you are nothing! Hero: So, it's Hero now, is it? I suppose the little urchin wants to be a Champion. Bah! You will never join our ranks! We are gods among mortals! Know this -- if you truly wish to become a Champion, you'll have to go through me. If we meet in that Arena, I will make you beg for death. The first of the IDs listed is for the champion when she is in the Bloodworks. The second is for her incarnation in the final arena match. The Construction Set lists her as a Pit Dog while her name implies that she is a Champion in the Arena faction.